From the first time A-WA hit the stage, the three Yemenite sisters have been dropping jaws, raising eyebrows, and making people dance. 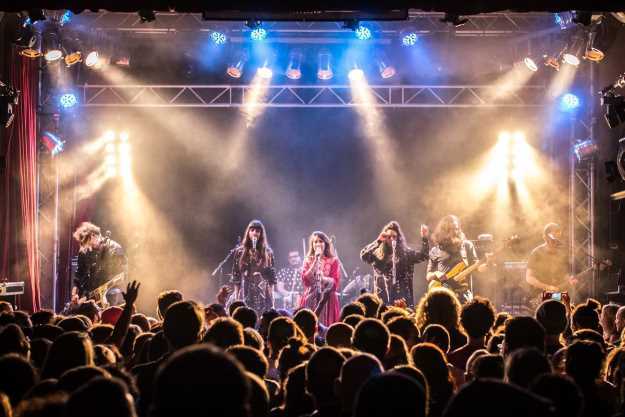 Liron, Tagel, and Tair Haim are the bright faces and colorful garb behind the ultra-successful band that has been empowering women in Israel and abroad since the release of their debut album Habib Galbi in 2015. With a second album on the cusp, Time Out sat down with A-WA's eldest sister, Tair Haim, to find out more about being a female&nbsp;powerhouse in the music industry. Where do your Yemenite roots stem from? We did not personally grow up in a Yemenite community, but our grandparents are Yemeni. When we were younger, we understood that Grandma and Grandpa had a different accent, and we often visited them, and attended hymn ceremonies and Yemenite weddings; we heard the Yemenite women drumming and singing their soulful songs, and we also heard our grandpa praying with beautiful trills. I read that in the Yemenite community, while men go to synagogue, women stay home and create their own folkore. In Yemen, gender roles have always been very divided. The women weren't educated so they never learned to read or write. Instead, they stayed in the house with their kids—cooking, cleaning—so they had a separate spiritual and culture world. While the Jewish men preserved the Torah, women had their own secular services where they created their own folklore through singing in unison. This oral tradition was passed down from one woman to the next through the generations. They used the songs to express their emotions, their feelings towards men, and everything they were not allowed to tell men and society. Are these the songs you drew your inspiration from for your first album? Songs like "Habib Galbi" were carried over to Israel from Yemen...they were created by strong women, so as strong women ourselves, we felt inclined to claim them and give them a new interpretation–ours came with a much younger and more current approach because we are influenced by many different styles in addition to Yemenite traditions. We fell in love with hip hop in the 90's with the appearance of MTV, incorporated some of our parents progressive rock vinyl from the 60's and 70's, plus we love American musical theater, which was common in the kibbutzim near Shaharut, where we grew up. How does it feel as a Yemenite and as a woman to continue these traditions? You're making huge strides in exposing the world to something they haven't been exposed to before. We feel very proud, especially in our abilities to take the songs Grandma sang around the kitchen and add new vocal harmonies to them. Traditional Yemenite music is sung in unison, while we added jazz elements and harmonies inspired by Motown singers to give the music a richer sound–it helps us feel more connected to the songs. How does the dynamic change when there are men on stage with you (i.e. your collaboration with Balkan Beat Box)? Balkan Beat Box are like our big brothers. We learn so much from them on a daily basis. When we collected and created the demo for the debut album, we decided to contact Tomer Yosef because Balkan Beat Box is an international band, they understand groove, they're super talented and amazing on stage. Above all, they give us respect and together we are able to show the world on stage and off stage that equality between genders can and does exist. Sure, in a good way though. We don't hate men–we love men, we love all good people. We feel strongly about the importance of empowering women no matter what. Even in 2017 women in Israel and beyond suffer from things like a lack of education or inequality in the workplace. Women always have to work harder than men, even in the music industry...it's a known fact. Wow, that's a tough reality. It is a big deal. But, we enjoy the challenge. We perform around the world in many festivals and each time we go over the lineup, we see that it's mostly made up of male bands. It forces us to put ourselves out there and empower women wherever we can. We try to set an example by being determined and continuing to work and learn the ins and outs of the business every day. We don't take anything for granted. We also make sure to choose the people we want to work with—those that make us feel good about ourselves and see our value as women and musicians and Israelis. We have several identities: we are Yemenite, and we're Jewish, and we're Israeli, and we're sisters, and we're Women…it's very important to surround ourselves by people who understand what we do and support us. Besides your grandmother, do you have any other strong female role models? We performed recently with Bracha Cohen. She's an older Yemenite singer from the tribe. We call her "Queen of the Tribe." She's been singing for so many years and we've hosted her here in Israel a couple of times. She is incredibly supportive. Yes. Growing up, we often listened to her cassettes, so being able to perform beside our role model is an incredible honor. And you know what? Every woman who goes after her dreams in general is a role model–not only singers. Sure, Beyonce is a role model, but so is our mom. She's a very simple and beautiful woman. We all do housework and have careers to take care of...in fact, I'm doing laundry as we speak. Do you think your music will impact the role of women (and Yemenite women) in the future? Definitely. It's meant to empower every woman who wants to be herself and feel comfortable with the many identities she wears. I think that in Israel, of course, the situation is different than it was for Grandma. In our generation, everyone is a mix of something so we feel less inhibited from doing what we love. Don't get me wrong, the Yemenite ladies are so great. I don't see them as simply "housewives," I see them as geniuses; their vocals are astounding. They are creators, they are artists, even if they are not aware. Right now we are working on a second album and unlike the debut album, it won't strictly include folk Yemenite songs. It's going to include original material that is still inspired by folk songs, but we want to take things to the next level this time. Can you leave us with some words of wisdom for aspiring women/musicians? It's very important to be true to yourself and discover your own sound, moreover, your own voice. This takes time. As three unique sisters we were inspired by many things, but our goal was to find the (feminine) power that came from within us and let that shine. Beautiful. Good luck with the rest of your laundry! You see, I am a real woman. During the day, I do laundry. At night, I perform. And I don't feel that it belittles me in the least. I do my laundry with pride.